2015 Student Field Reporter Project: We’ve enlisted the help of several students to share their 2015 Amazon experiences with us. Over the coming months we will regularly feature their posts, photos, and reflections – letting them tell their amazing stories of the Amazon and it’s impact on their lives! I’ve always thought that coming out of a plane and descending one of those rolling stairways to the airstrip below always looked really exotic and travel-ly; the kind of thing Tintin would do in my brother’s old comics. It was only when I stepped out of the airlock door and walked carefully down skid-taped metal to the warm concrete airstrip of Iquitos, Peru, that I found it felt pretty cool too. Finally, we have made it. It’s been a long trip, with many hours in the air and on the ground. We left Gunston right after Disembarkation and drove by bus to the nearby camp to pick up the seniors. From there we went to Dulles and boarded a plane to Fort Lauderdale. We arrived after dark, went to a Miami hotel to crash for a blip of sleep, and rose at the inhumane hour of 4:10 AM to make our 8:00 flight to Panama City. From the isthmus we then flew to Iquitos, our final destination by plane. We still had a ways to go, but the scenery was vastly more interesting. We were in Peru, finally. We cleared customs at the Iquitos airport and were met by the incomparable Lucio, one of our two guides for this adventure. He led us out of the airport and into an air-conditioned minibus that carried us through the streets of Iquitos. 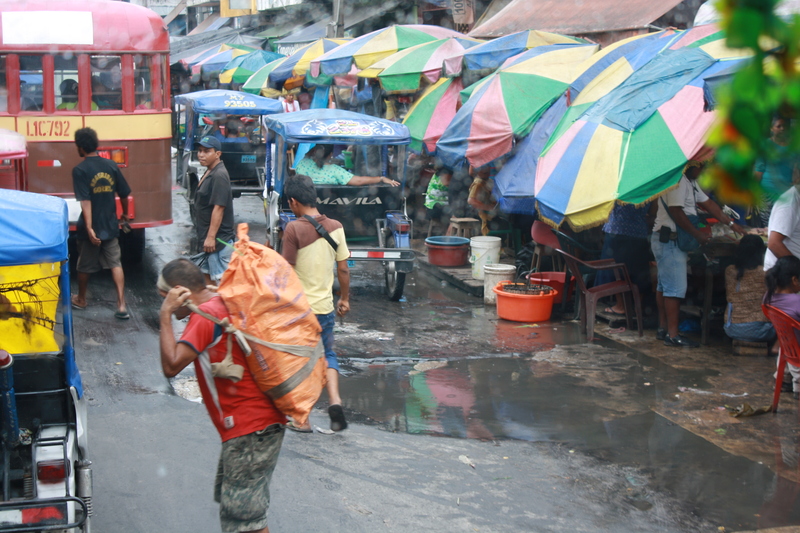 As Lucio explained on the way, Iquitos is named after the first tribe of native people that lived in this area. It is a small but lively city, complete with the Plaza de Armas that adorns all large Peruvian settlements. It was on that drive that the outward differences between our native America and this new, wild land became apparent to us. In America, the streets are generally, outwardly organized. Traffic is a pattern, regulated by lights or hand signals, and you wouldn’t see vehicles beside one another on a narrow, one-way street. Not so here. 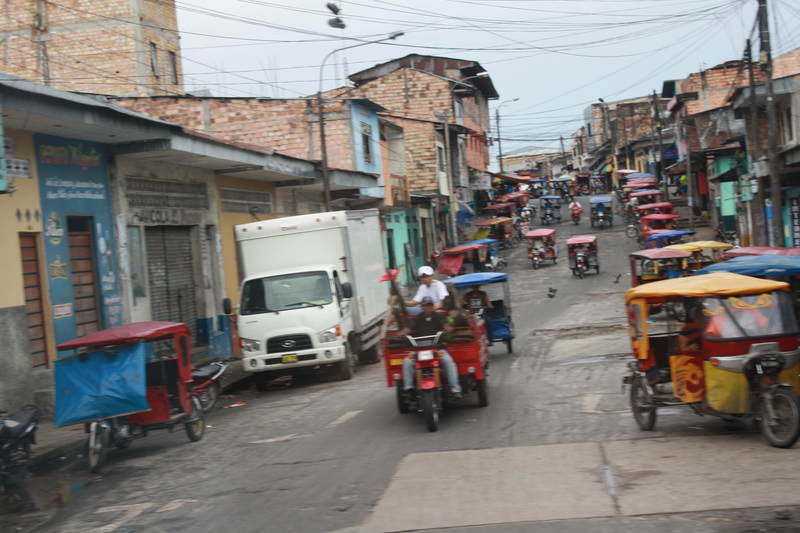 Iquitos is a loud, crowded, colorful animal, and the streets are the blood vessels flowing through it, each red cell crowding for space and moving along. There are not many cars or trucks. Most motorized modes of transportation are muddy, agile motorcycles or tuk-tuks, converted dirt bikes with a small, covered seat for two attached to the back end while the driver sits on the chassis. Behind the driver is typically a multicolored webbing, the weaving pattern individual to each tuk-tuk. Others go by foot, picking their way through the cluttered sidewalks. We passed through the marketplace where tarps laid out on the cement were covered in ripe bananas, coconuts, and other bright, delectable-looking fruit. Fish vendors gutted piles of piranha on knife-lined cutting tables. Ribby dogs wandered around or laid curled against the buildings, which were themselves a mash-up of old architecture and new. We passed what Lucio called the plaza de heroes, where war heroes are honored with monuments. Many people waved as we passed by and watched; others simply watched back carefully, reiterating another of the differences I noticed here. The feeling of being a tourist is something I’m not really accustomed to. I have traveled to places where I was different, sure, but I was younger then, and less tuned in to the intricacies of culture. It really struck home when we came into the Iquitos airport and were following Lucio out. Many people stared at us, at our pale skin and strange clothing. Gringos, I thought, the name in many Central and South American places for Americans. I was expecting it, but it’s always a little jarring having a visible reminder you are no longer the majority. The people who have accommodated us, however, are infinitely polite and helpful. Lucio and our brave driver took us effortlessly through the wildness of Iquitos to a dock, where we were greeted by friendly mutts and treated to a bathroom, fresh water, cookies/crackers in small packages, and the most freaking delicious bananas I have ever had the pleasure to consume (I ate two). We then bundled into Explorama’s rapido, a covered, open-air speed boat that is the best way to get somewhere fast on the river. We pulled away from the dock and set out over the muddy water. I’ve seen many pictures of the Amazon, and read about it, but when we sped out over the currents, the wind running fierce fingers through my sticky bangs and whipping away from my face, I knew my imagination could not do it justice. The Amazon, and even the tributary we first went out on to take us there, is massive, wide and deep with shifting countercurrents and powerful running water surging past its red clay banks. Mats of greenery bob alongside sticks and deadheads, and the locals go by in dugout canoes or covered boats. The sky looks bigger down here, filled with puffy white clouds standing out against their tarnished undersides. The rainforest rises above the riverbanks in tangles of shadowy green, while huge emergent trees rear above the rabble like the heads of dragons. It is a forest of secrets and danger, and I couldn’t wait to see it up close. Everything about this river and this place hums with life. We roared down the river for a little over two hours. We were heading for the Explorama Lodge where we would stay for our first night. I kept drinking in the scenery, unable to take my eyes off the shoreline and the sky. After a while we turned left into a small tributary, racing up it (no apparent speed limits here, another, fairly welcome difference from America), passing plants and trees that would be much taller in the high-water season. It is something out of science fiction, taking a boat through a flooded forest. It was quiet other than the motor and the omnipresent hum of insects. When we reached the Lodge we unloaded and found our rooms, charged cameras and phones and went over the nightly group-up, and ate a delicious dinner prepared by the Lodge staff. Kaeo, my brother, somehow spotted a smallish tarantula chilling on one of the walkway rafters. We snapped shots and I took a picture before my camera battery, already drained from my pictures and videos from the ride here, died for good. Later, after dinner, we went for a night boat ride. Our driver turned off the motor and the lights and we gaped at the stars, twinkling unimpeded by the light pollution of the cities. Lucio showed us the Southern Cross, and I found the Dipper and Polaris, taking a little comfort in the face of all this newness that I still knew which way was north, despite my excitement. He also pointed out katydids and cockroaches and strange mimicking spiders, and a tiny snake coiled loosely on a large leaf. We followed the loop back to the Lodge, were we stumbled sleepily along the wooden walkways and crashed for the night. We were pumped, but our bodies were tired from travel, and we had another early morning, and another amazing day, coming with the rising of the sun. Bird! This is beautiful! I feel like I am there. You are a very gifted writer! Thank you for sharing this here! I love it! Bird, I am so proud of you and the way you are capturing every detail, giving us images that put us right there. The emergent trees like the heads of dragons, the wind “running fierce fingers” through your sticky hair…. seriously great stuff. Can’t wait to read more, keep ’em coming! I really enjoyed reading this post. Keep ‘em coming, Kailani! We can’t wait to hear what’s next! Great job of capturing the experience, Birdie.